In April, over 1,000 people tragically and needlessly lost their lives in Bangladesh after a garment factory built illegally on an unsafe site collapsed. Since then, measures have been taken to improve safety measures and increase the garment sector's minimum wage — but the change offered by the Ministry of Labor is far from sufficient. As of now, the pending legislation will raise the wage from about $38 to $66 a month. Even with this 77 percent increase, Bangladesh's 4 million garment workers — most of whom are women — will remain the worst paid in the word. According to ThinkProgress, unsatisfied workers had been calling for $100/month or more. 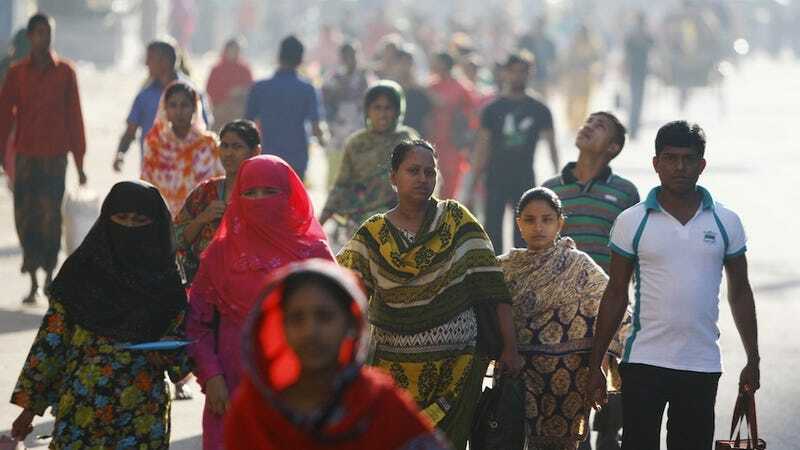 Frustrated with the slow progress of the proposed bill, thousands of activists and garment workers took to the streets of Dhaka on Monday morning demanding that the minimum wage be raised. The protests quickly became violent, resulting in the closure of over 100 factories and an estimated 30 injuries. According to Reuters, Bangladeshi police fired a water cannon, tear gas and rubber bullets into the crowd. The protesters were armed with rocks and sticks. Because companies can get goods so cheaply (read: illegally) manufactured in Bangladesh, it's become the world's second-largest apparel exporter — after China. The nation earns over $20 billion a year from garment exports, most of which go to the United States and Europe. In the wake of the devastating factory collapse six months ago, 70 U.S. and European retailers signed a legally binding agreement to upgrade safety conditions in the factory. Of course, several very popular brands did not. Despite the international outcry, factory owners are loath even to pay the new proposed minimum wage. As one protestor told Reuters, "Owners are indifferent to our demand. They are not even ready to pay what the wage board proposed." And as long as consumers overseas continue to support this cycle of abuse, indifference and exploitation, it seems unlikely that any efficacious change will come.